Ubisoft Singapore won Singapore Computer Society’s ‘Best Tech Company to Work For’ award! 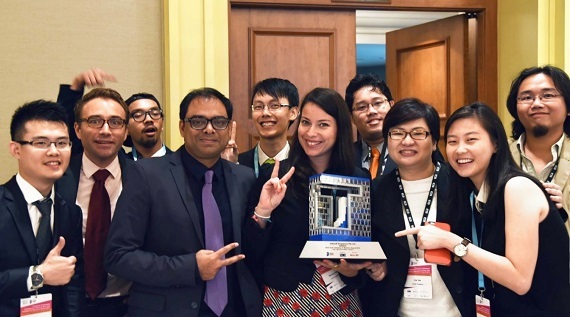 In 2015, we were very honoured to have our efforts recognized by the Singapore Computer Society when we were named the “Best Tech Company to Work For” – a tremendous testimony of our excellence in innovation, talent development and organizational culture. We were thrilled to have this achievement featured in The Straits Times, Channel News Asia and Today Online. We began our journey 8 years ago from humble roots; as a small studio in an infant industry with only 2 employees. Nevertheless, our determination to succeed eventually saw us bagging numerous note-worthy successes over the years. We’ve been a trusted partner of lead studio Ubisoft Montreal and worked on many AAA projects, including the spectacularly popular Assassin’s Creed franchise. Most significantly, we’re proud to have led the development of an unprecedented and highly-acclaimed feature in Assassin’s Creed – naval combat and gameplay. Today, our studio is over 300 people-strong and we’re widely recognized as one of the pioneers of the game development industry in South-East Asia. Our triumphs were achieved through an outstanding mix of creative diversity, open-minded studio values, excellent people-oriented management and an abundance of talent development opportunities. Our employees are always encouraged to dream of the coolest and most exciting features to put into a game and are challenged to execute them well. We also offer diverse training schemes for our employees to gain new skills, and these range from overseas deployment and global developer conferences to massive open online courses and scholarships to encourage continuous learning. Most importantly, we understand that a multicultural, energetic and causal work environment running on a flat organizational structure is necessary for creative communication, studio growth and the development of our most inspired and brilliant game concepts. For these reasons, we are very proud to receive this award as a resounding recognition that we’ve been doing it right. The industry is growing like never before, the future is bigger and brighter than ever, and there is no better time than the present to be a video game company in Singapore. Great win, Ubisoft Singapore, and may we achieve many more awe-inspiring successes!